Our car rental experience will make your Santa Cruz de Tenerife vacation the most comfortable ever! You don’t have to compare car rental prices of lots of car rental companies anymore - we’ll do it for you! 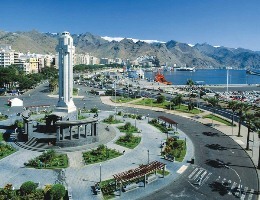 Car rental Santa Cruz de Tenerife is an easy route to start an exploring tour right from Santa Cruz, Muelle Ribera or North Airport driving reliable cheap rental car got for the best price. Just use our search form to choose your dream rental car in Santa Cruz de Tenerife! With car rental Santa Cruz de Tenerife you can go sunbathing on the beaches with black volcanic or yellow soft sand and make memorable photos anywhere! Then go diving somewhere in surroundings. You can make a tour around the whole city and buy souvenirs in local shops. You must get a photo with the luxurious flower clock and see Teide volcano. RentalCars24h.com offers you reliable car rental Santa Cruz de Tenerife services that will help you to feel free and independent when moving around the town. Providing best online prices for car hire Santa Cruz de Tenerife services, RentalCars24h.com allows you to save money each time when you rent a car in Santa Cruz de Tenerife.